The congregation, choir and clergy encircling St Oswald's Church, Guiseley, for its traditional 'clipping' ceremony. 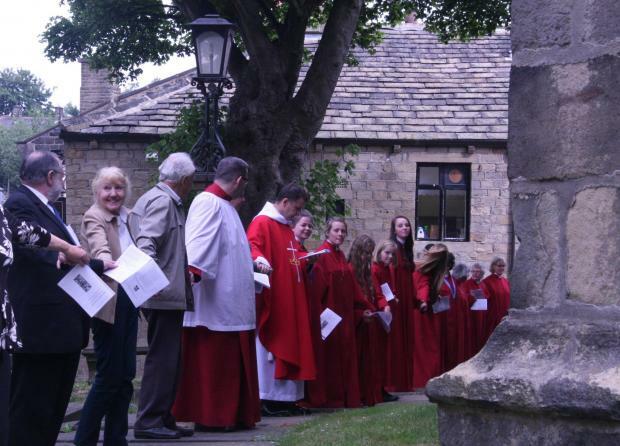 The entire congregation of St Oswald's took part in the event, to mark the feast of St Oswald, last Sunday, July 5. During the morning service all those assembled were led outside by the choir, churchwardens and clergy to encircle - 'clip' - the church while singing the Ballad of St Oswald. They then shouted "God bless our church!" and, after turning to face outwards, "God bless our town!" The Rector of Guiseley with Esholt, David Pickett, said: "Even though we have a really large church we easily managed to encircle it to give thanks to God for his many blessings. "This is my first ever 'clipping' and hopefully not my last. Fantastic!" 'Clipping' is thought to come from the Anglo Saxon word clyppan, meaning to embrace or clasp. St Oswald's is one of only a handful of churches in the UK to still hold the ceremony. In Guiseley it takes place every year on the first Sunday of July.